This article was updated on 30 Nov 2011, and is filed under Research Provocations. Leon Gurevitch Research Provocation: What is Stereoscopic Media? In 1838 Charles Wheatstone announced his invention of stereoscopy. Wheatstone’s stereoscope did not gain mass popular attention, however, and the story of its eventual market development is now well documented as one of the many tales of commercialiser triumphing over discoverer (Shivo, 2003; Zone, 2007). While Wheatstone claimed to be the first to develop stereoviewing, David Brewster eventually developed it (in conjunction with photographic image production) and showcased it famously to Queen Victoria at the great exposition of 1851 where it gained immediate mass popular attention. Retrospectively Wheatstone explained the commercial inviability of his initial stereographic experiments on the basis that: “At the date of the publication of my experiments on binocular vision, the brilliant photographic discoveries of Talbot, Niepce, and Daguerre had not been announced to the world. To illustrate the phenomena of the stereoscope I could therefore, at that time, only employ drawings made by the hands of an artist.” (Zone, 2007). In the historical narrative of Brewster’s outmanoeuvring of Wheatstone the fact of stereoscopy’s early origins in the hand drafted image has generally been passed over. 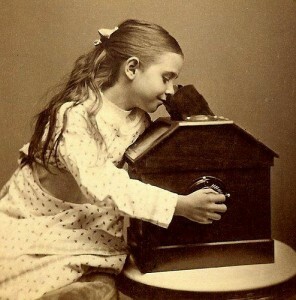 But the recent return of stereoscopy to our audiovisual culture bears an interesting parallel with Wheatstone’s early discoveries and experiments. Contemporary stereoscopy is premised upon the non-indexical, visual nominalist, capacities that computer generated imaging has facilitated (specifically the capacity to fabricate a perspectival image that nevertheless appears photorealistic).This has introduced a circularity to the tale of stereoscopy’s long and continued development. Historians and visual theorists (Crary, 1998; Schiavo, 2003; Maxwell, 2000) of stereoscopy’s pasts have often focused upon its eventual birth as a photographic form as simultaneously the reason for its triumph and the reason for its equally rapid failure to survive as a mass medium. Photographic technology, they argue, might have allowed mass proliferation of stereography, but its monoscopic alternative also challenged stereoscopy by offering the fiction of objective vision. With the emergence of CGI amongst audiovisual technologies in the twentieth century, the fiction of objective vision attached to the camera obscura and its successors has been eroded (even while scholars have pointed out that it was a questionable fiction to begin with anyway). As Lev Manovich (2002: 195) has asserted, with the application of CG manipulation to our photorealistic image culture, a historical circularity emerges in which the indexical, mechanically reproduced image becomes an anomalous interlude in a history of predominantly hand crafted image form. Equally, the claim that stereoscopy lost out to its monoscopic alternative as a viewing technology that could offer the illusion of objective vision is, and always has, been premised upon the elevation of a monoscopic/stereoscopic dichotomy to the detriment of a case by case exploration of the very different viewing technologies and contexts to which stereoscopic viewing were put to use in the twentieth century. Stereoviewers may well have been one of the most popular photographic formats in its early days before eventually losing ground to its monoscopic successor but it is not clear that this was due only to the necessity for the illusion of objective vision. Similarly, well documented anecdotes of Lumiere trains in anaglyphic 3D, or John Loggie Baird stereo-televisions of the 1940’s does nothing to convince contemporary scholarship that the real inhibitor of stereoscopic technology was not still the technical challenges of delivering such technology and content to a mass market. By the same token, contemporary analysis of the current stereoscopic renaissance runs the risk of reduction if its current growth is put down only to a digital “revolution” that supposedly washes away all other industrial, economic and technological interests in the process. With this in mind there are a number of questions to be asked of stereoscopy’s current renaissance. Not just why has it returned and whether it ever really went away (in the popular imagination at least), but also what are the convergent sets of industrial interests driving its current return? More specifically, we should ask to what extent narratives of convergent media platforms may be aligning to make stereoscopic media an easy sell, and to what extent differing technologies and industries impact upon each other in this landscape? Avatar may have confirmed James Cameron’s continued box office success, but the wider question to spring from his promotion of stereoscopic cinema is, to what extent will this require a burgeoning stereoscopic television market to maintain broader ancillary markets? Where Wheatstone found that discovering a technology did not amount to mass adoption of it, Brewster may have been more surprised to discover that mass adoption did not amount to longevity of it. For contemporary scholarship of stereoscopic media the current questions regarding stereoscopy need to address not only where the technology stands, but where it might go, and why, if this time it is to be different. Intriguingly, current complaints about, and current developments in, stereography suggest that the fiction of objective vision may raise its head in a new form. While television makers promise to bring auto-stereoscopic flatscreens to market, the possibility that there would be a means of engaging with the 3D image without the need of an optical intermediary could leave stereoscopic cinema struggling to compete. In this instance (as with the photographic example of a hundred years previous) it is not clear to what extent viewers would reject a stereoscopic form that fails to deliver the fiction of objective vision and to what extent they would simply be hungry for a stereoscopic form that does not require the disruptive apparatus of an optical intermediary. Crary J (1998) ‘Modernizing Vision’, In Foster H (ed). Vision and Visuality. Seattle: Bay Press. Ivins W (1975) ‘On the Rationalization of Sight’, New York: Da Capo Press. Jay M (1994) Downcast Eyes: The Denigration of Vision in Twentieth-Century French Thought. London: University of California Press. Jay M (1988) ‘Scopic Regimes of Modernity’. In Foster H (ed). Vision and Visuality. Bay Press: Seattle. Jenkins H (2006) Convergence Culture: Where Old and New Media Collide. New York University Press: London. Manovich L (2001) The Language of New Media, MIT Press: London. Maxwell, A (2000) Colonial Photography: Representations of the ‘Native’ and the Making of European Identities, Leicester University Press, London. Michelson, A (1989) The Art of Moving Shadows, The National Gallery of Art: Washington. Mulvey L (2004) ‘Passing Time: Reflections on Cinema from a New Technological Age’. Screen 45. No. 2: 142-55. Panofsky E (1991) Perspective as Symbolic Form. Zone Books: New York. Schiavo, L B (2003) ‘From Phantom Image to Perfect Vision: Physiological Optics, Commercial Photography, and the Popularization of the Stereoscope’, In Gitelman and Pingree G (eds) New Media, 1740 – 1915. London: The MIT Press. Zone R (2007) Stereoscopic Cinema and the Origins of 3-D Film, 1838 – 1952, The University of Kentucky, Kentucky. © 2011 Stereoscopic Media. All Rights Reserved.